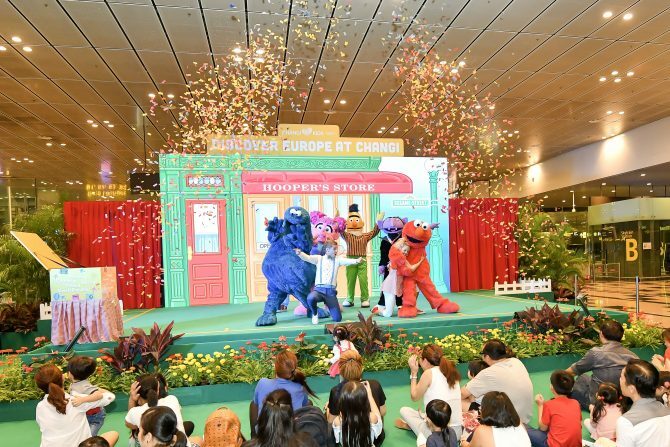 From now to 24 June, Changi Airport is graced by the lovable Sesame Street characters who are set to bring the little ones on a journey across Central and Eastern Europe! Taking place at Terminal 3, the likes of Elmo, Cookie Monster, Bert and Ernie, Count von Count and Abby Cadabby will make an appearance to give out hugs at live shows and meet-at-greet sessions. The aviation space is also decked out in view scale reproductions of Central and Eastern Europe landmarks that are made out entirely of cupboard! Not only is it most sustainable, the cupboard reproductions guarantees a immersive and informative experience for imparting cool facts about the less-than-travelled areas of Central and Eastern Europe. “With the host of activities planned for this June school holidays, families will find their time at Changi Airport a fun and fulfilling one. From opportunities to meet with familiar and timeless Sesame Street characters up close, to learning more about destinations in Central and Eastern Europe, there’s something for everyone in the family,” said Mr James Fong, Vice President for Landside Concessions, Changi Airport Group. Every weekend, the exclusive world premiere of the ‘S is for Sharing’ live show is set take place, where Elmo, Cookie Monster, Bert and Ernie, Count von Count and Abby Cadabby will sing and dance as they unravel a mystery package from Count von Count’s family in Romania. This June’s installment of the Changi Loves Kids campaign offers an interactive experience with the characters including fan meet and greet sessions and opportunities to take photographs with the loveable characters.